Our semi-underground containers (Series S) are a robust, cost-saving response to difficulties relating to population density or lack of space. Reliable and aesthetic, the BIHR semi-underground containers are designed particularly for suburban and rural areas. This concrete/steel model is recognised for its robust and fire-resistant qualities. Semi-underground containers ensure efficient, cost-saving management of various waste flows and convenience for users. Tank storage capacity: 3m³ to 5m³, i.e. 3000 to 5000 L.
The wide range of finishes (smooth or imprinted concrete) and cladding (bricks) offer a considerable number of attractive combinations and seamless blend into the environment. 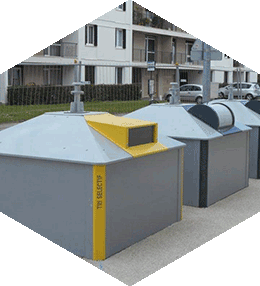 Positioned at the foot of apartment blocks or at recycling points, the various waste flows are easily managed whilst promoting a clean and attractive environment. The semi-underground container inlets can be customised in line with the selective sorting requirements of the recycling station. These holes can be either front or top access. The waste is isolated from high temperatures as it is stored underground. This design therefore reduces the impact of unpleasant smells near containers during the winter cold and the dry summer weather. These models are also suitable for areas with major climate constraints such as mountain and coastal areas. To protect the environment, the system is entirely sealed, thereby avoiding any risk of leaking and pollution. The BIHR semi-underground containers are especially suitable for installation in areas with moderate or low population density. Our products can today be found in suburban and rural areas, in motorway rest areas and mountain resorts. All products from "Crane truck collection"